The father of the man found dead in a Long Beach auto body shop said he broke the lock to get inside Sunday. A woman who'd been in a relationship with the man was also dead. Photo by Jeremiah Dobruck. 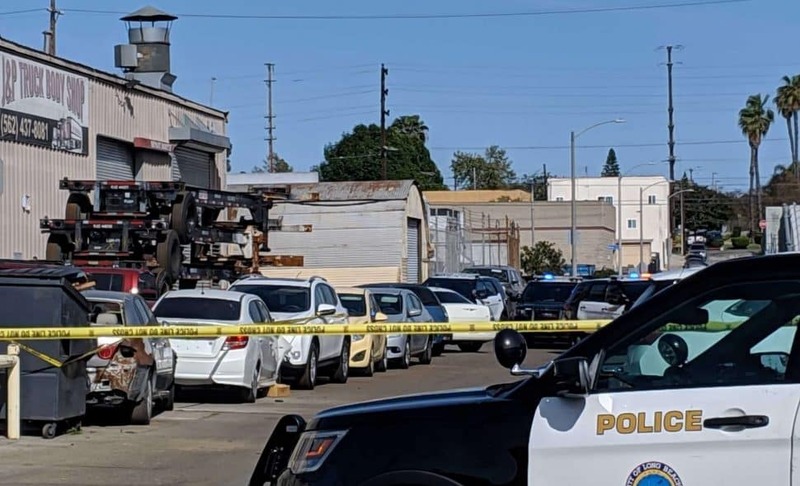 The man and woman found dead Sunday in an industrial area of Long Beach had been a couple for nine years, according to relatives who suspect they died in a murder-suicide. The husband had been texting his family overnight saying goodbye, his father, Oscar Hilario Montoya, said. Montoya and the wife’s mother, Ines Iraheta, said they went looking for their children after the texts. When they checked the couple’s auto-body shop on 14th Street near Oregon Avenue on Sunday, they found their cars outside, Iraheta said. Montoya said he broke the lock and, inside, they found their children: 42-year-old Blanca Estela Dominguez and 37-year-old Oscar Montoya Tejada. The couple, who didn’t have children, worked and slept at the shop, according to the parents. They’d recently been having problems, Montoya said. Family members suspect murder-suicide after the man and woman were found in their auto shop on 14th Street near Oregon Avenue. Photo by Valerie Osier. After they called for help around 3:20 p.m., rescuers from the Fire Department were the first to the scene, according to authorities. Fire crews called in police, who shut down the block and brought in homicide detectives. Dominguez had been stabbed multiple times, and Oscar Montoya Tejada had apparently shot himself, according to police, who are treating the situation as a murder-suicide. Police said there weren’t any previous reports of domestic violence between the two. A search warrant left at the auto shop said police found a knife, two guns and a spent round. Oscar Hilario Montoya said the gun was his son’s. Looking around the cramped auto shop packed almost entirely with car frames and equipment, Oscar Hilario Montoya said he doesn’t know what to do next. Near the front of the shop, Iraheta dug through a box of cleaning supplies, sobbing. Editor’s note: This story was updated with more information from police.